What a fabulous thing to collect! Such pops of beautiful colour. Perfect for showcasing in a frame on a lovely white wall. I have a collection just like this one! I have about 100 laminate sample tags different textures and materials (all the same size) made out of wood, plastic, & metal. Thanks for posting these great collections. We'll make sure to feature you on our Facebook page! I love colour chips and all your lovely collections. Thank you for your blog. 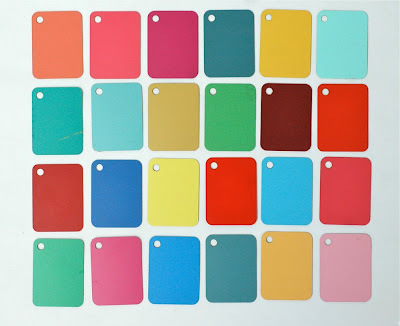 This post remembers me how I loved to watch the colors, to fell the texture, and the scent of paint sample tags. I found your blog through a “Words and Eggs” (http://wordsandeggs.squarespace.com/) link. What a wonderful idea! I really love it. To Share with everybody the beauty of little things. To all of us who collect everything for no particular reason but the charm of the item, this is just a great idea. Thank you for sharing. I just love your blog. «Collectionaday» encouraged me to free all those little things I'm keeping in drawers. It's kinda crazy how many collections we have in common. Do you collect the plastic cores from scotch tape rolls? Because that's probably my weirdest collection.